One of the great features of Ghost saddles is that since the seat is removable, it's possible to change the shape and size of the seat for the rider. Ghost makes a nice velcro wedge to reduce the seat about 1/2" - 3/4" of an inch. It's cushy as well. 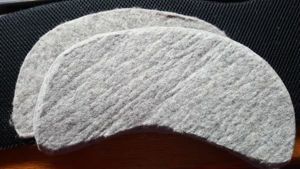 I also have some homemade wool felt pieces I make that can do the job as well as have addition features for growing/changing riders. They're two pieces, one 1/2", one 1/4" that can be used together or separately for 1/4" incremental changes. Great for people who change weight through the year or growing kids or also people who share saddles. If you're between seat sizes, using seat reducers, pommel bolster, and a seat saver can all have an effect and the seat reducers and bolster also have a small effect on creating a deeper seat - see the pic with the felt reducers. 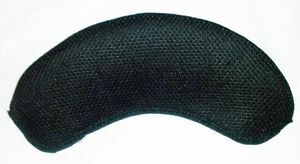 Velcro wedge to reduce seat size about 2cm (1/2-3/4"). It has a bit of cushion as well. For those who want a cheaper option or more ability to customize, I've made some less polished seat reducers from wool felt. And here's a hint - if you have similar material laying around, you can make your own or even do other customizations to the fit of your saddle.